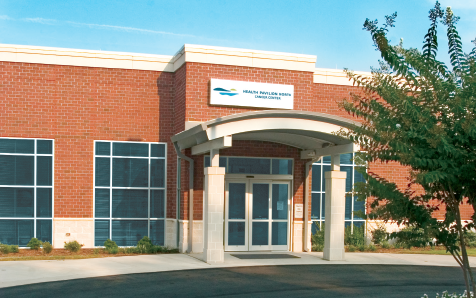 At the Health Pavilion North Cancer Center, we're pleased to offer medical and radiation oncology to residents of northern Cumberland, Sampson and Harnett counties. Our cancer patients can now receive the treatment they need, closer to their families and friends, making the often seemingly full-time job of repeated treatments more convenient. Health Pavilion North is located one block north of the I-295 interchange in Fayetteville, making it easily accessible from I-95. Services offered through the facility include radiation therapy, chemotherapy, social work, the Oasis Complementary Medicine Program and other support services. In additional to the Cancer Center, Health Pavilion North offers an ExpressCare, physical and occupational therapy, diagnostic services, pediatric care and a pharmacy. Hours of operation: Monday-Friday, 8:00 a.m. to 5 p.m. Appointments needed. Call (910) 615-3840. Located at 6387 Ramsey Street, Fayetteville.